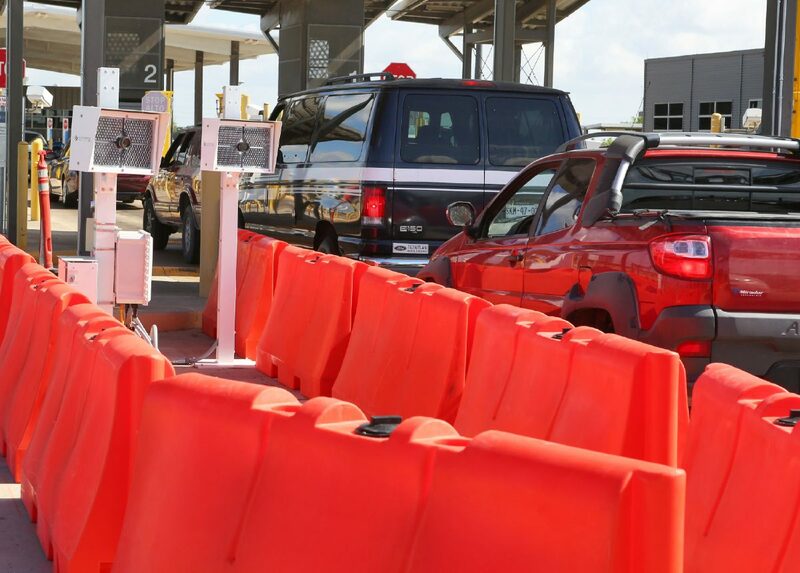 Cameras scan vehicles entering the Anzalduas port of entry to capture facial biometrics as they wait to enter the United States from Mexico on Thursday, Aug. 30, 2018, in Mission. Ever been told you look like somebody else? Sharing features with another person, especially someone famous, normally is inconsequential, drawing little more than a laugh. The development of facial-recognition technology, however, and its utilization by law enforcement agencies, has raised some concerns. Many people crossing the Anzalduas International Bridge southwest of McAllen soon will find out if those concerns are warranted — especially if someone bears a resemblance to one of those “bad hombres” that has President Trump so worried. U.S. Customs and Border Protection last week announced it will conduct a yearlong test of facial recognition at two of the bridge’s three lanes. The Department of Homeland Security has multimillion-dollar contracts with Microsoft to develop the technology. The agency began scanning faces last month at airports nationwide as well as the pedestrian lines at the San Ysidro bridge between San Diego and Tijuana. For a year, Anzalduas will be the only port of entry using facial scanners on people in cars. CBP says the system is voluntary, and crossers who wish to avoid it can use the lane where the technology isn’t being used. Facial-recognition programs have been around for more than a decade, and as people have grown used to it they have become more accepting of it. Some computer and cellphone users now can use face recognition to unlock their devices instead of entering a password. With regard to the systems’ use by law enforcement, people worry about lost privacy. Some have voiced fears that police will use such programs to scan the stands at sporting events or other public venues looking for suspects and fugitives. An erroneous match could cause unnecessary problems for innocent people, they fear. Such concerns are valid. Testing of various facial-recognition programs shows increasing accuracy, although that accuracy falls as databases get larger. Small tests of mugshots taken under controlled conditions have reached 95 percent accuracy, although that falls to as low as 33 percent when they have to scan more photos. More importantly, the algorithms creating face recognition appear to expose racial biases. They are generally more accurate with white men, and less so with women and various ethnic minorities. In contrast, a 2011 University of Texas at Dallas study found that software developed in East Asia recognized East Asians better than Caucasians. Perhaps to their computers, we all look alike. In addition, real-world use seldom matches the quality of controlled tests. CBP says it will delete images taken at the Anzalduas bridge after 14 days. We trust they will be used to improve the system and reduce the chance of false hits. Ideally, facial-recognition technology can be another tool to make entry into the United States faster and easier. At worst, it could create headaches for somebody who has the misfortune of looking like a fugitive from the law.